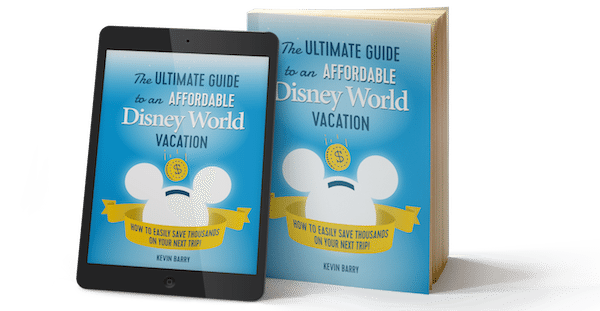 I recently received a complimentary review copy of a new Walt Disney World trip planning resource, Kevin Barry’s book The Ultimate Guide to an Affordable Disney World Vacation. It was an easy read while still very thorough. The book is divided into sections as readers follow along with the Barry family’s trip planning process. The “Getting There” section, for example, has excellent tips on booking airfare, extrapolated from Cheap Air’s annual airfare survey. These tips are good for travel anywhere! There are also tips for bidding on Priceline, how to find good rental car deals, and even making your car more fuel-efficient if you’re driving to your destination. For many of us in this community, this is information we already get from Cheap Air, Bidding for Travel, and other sites. Folks who don’t travel a lot or aren’t used to doing this kind of research might find several invaluable suggestions. For that reader, Kevin breaks down the process into super simple steps, and even includes screenshots to make it easy. When discussing park tickets, lodging, and dining, I love that this book doesn’t deny that vacations are perhaps a time to splurge when possible. Kevin looks at ways to save money on all of those budget areas, but doesn’t ever suggest you eat peanut butter and jelly sandwiches in your car (like my husband and I did on our honeymoon!) or stay in a sketchy motel miles away from the parks. He shares two sides of several arguments, such as why park hoppers are totally awesome… and why they absolutely aren’t necessary for every trip. Barry makes one of my favorite points: by being “stuck” in one park all day, you’ll get to see the park change from day to night, and you’ll likely get to take in details, stories, attractions, and experiences that you might otherwise overlook when rushing from one park to another. These are the kinds of tips that I can’t put a price on. Readers will also find suggestions for lesser-known dining options such as the Garden Grove character meals, but again – this will only be new information to some. Overall, I thought the book was put together well. The details were excellent, it had just the right number of pictures, and I love the addition of Disney “Fun Facts” – both as a nice diversion, and the way they were actually designed and implemented in the book. I thought the concept of following a family along as they examine their savings in each area of vacation planning was clever and extremely effective. If you haven’t visited Walt Disney World before, this may be a great resource. I have a few caveats, however, that I couldn’t leave out. This book would make a great addition if (like I did when we first started traveling) you plan on reading anything you can get your hands on as you make your own decisions. There are several instances, though, that you need to proceed with caution. It’s extremely heavy on utilizing credit card points for savings, in every section along the way. While I admire (and personally subscribe to) the ability of blogs like The Points Guy and Mommy Points for traveling the world on a budget using mostly credit card benefits, it should be very clear that opening numerous high-stakes credit cards is not a great choice for a lot of readers. Some will not qualify for difficult-to-get cards, some have a history of poor spending habits when charging purchases; others, perhaps the “perfect” candidates for such tricks, will want to travel far more often than these one-time offers allow. Additionally, there is a section on Disney Vacation Club that is wildly inaccurate. I think renting DVC points is one of the coolest options for people who aren’t quite sure membership is for them (or people looking to get Deluxe Villa resorts for a fraction of the cost), but the chapter serves more as an unresearched opinion than a resource. If you were to remove all of the sections on credit card perks and the Disney Vacation Club section, the book would be much smaller – but would still offer some value to the right audience. The book is reasonably priced on Amazon right now (free for Kindle Unlimited members! ), so it’s a low-risk purchase. I absolutely would have bought it when I began planning my first trips – and I would have gotten a handful of gems out of it. If you’re only buying one book though, take a good look at it as one option of many and decide what is best for your family. You may also want to check out (what I think is the authority on detailed Disney trip planning!) The Unofficial Guide to Walt Disney World by Bob Sehlinger and Len Testa, or for very similar quick and easy savings-based tips, Lou Mongello’s 102 Ways to Save Money for and at Walt Disney World. Best of luck planning your magical vacation; whatever you decide to read and research, the anticipation is half the fun! Oh, how I agree with your last statement in this post. Honestly, sometimes I think my planning and anticipation are MORE than 1/2 my fun – probably because they last so long and then the trip itself goes by much too quickly. I haven’t yet had opportunity to try renting DVC points, but we have been fortunate enough to stay at Bay Lake Tower with friends and I’d love to spend a family vacation week in a villa sometime!